RGI has provided the hostel facility for boys in the view of providing a secure atmosphere to boys.It has got good facilities and infrastructure which makes students feel comfortable and find a homely atmosphere. Being away from the city hubnubs, the hostel a serene and calm atmosphere. to students with modern amenities and recreation facilities. All the hostels have their own coffee shops,canteens, photocopy units and printer rooms. Every room has its own network connection, which enables fast and round-the-clock Internet access. 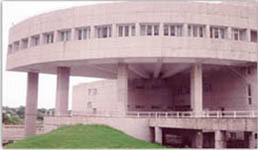 For the visitors, the institute provides guest-rooms. Ragging is strictly prohibited in the campus. We are one of the premier hostel providers for our students. Radharaman Group Of Institutes takes special care to see that all students get a dite that is prescribed to keep them fit and agile, to study better.Dine at the same time serves all students and staff breakfast ,lunch and dinner with ice cream and sweets . Well furnished spacious rooms with double/single occupancy with tiles flooring. 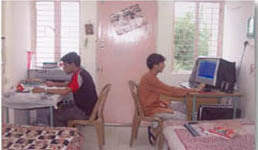 Personnel computers with net connectivity of (128KBPS) to all the rooms. Water cooler with water purifier & water geezer (for winter use). Library containing all the technical & non technical books (fiction & motivational books) & magazines. Indoor sports providing the facilities of Carom, Badminton, Chess, Table Tennis etc. In campus ATM & Swimming pool (proposed). Round the clock hostel attendant. Mess facility providing quality foods & snacks (providing Indian, South Indian, Chinese, Vegetarian & non- Vegetarian foods). Accommodate 70 persons is also provided. Staff includes warden (2), Sub-warden (1), system analysts (2), Supervisors (2), Scavengers (3), Security men(6). Detailed thought and consideration has gone in to provide utmost comfort to the students with more personal space provided in an ideal location. The students of all programmes live together in the hostels which helps in developing a healthy and cordial relationship among them. Ragging is strictly prohibited in the campus. Every student should have the right kind of nourishment. It is a vital important part of any education system that is usually overlooked. A weak regimen can make a student fatigued and tired and the wrong food can lead to eccessive fat and set leathargy. Radharaman Group Of Institutes takes special care to see that all students get a dite that is prescribed to keep them fit and agile, to study better.Dine at the same time serves all students and staff breakfast ,lunch and dinner with ice cream and sweets .